I was a shy musician as a youngster. 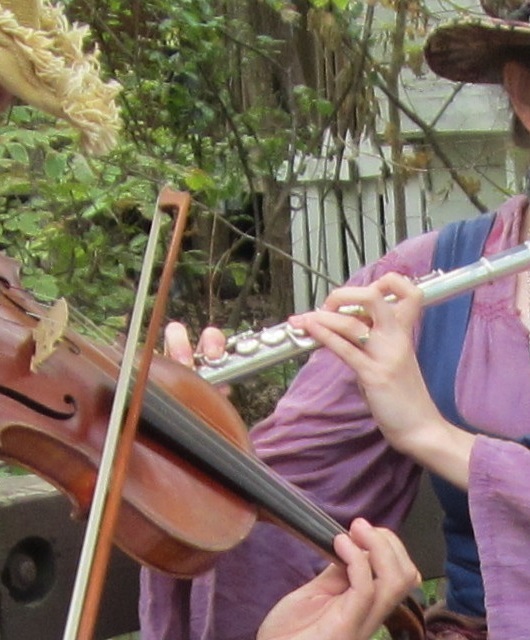 When I first started playing flute, it was quite a challenge for me to "play out" in ensembles. Don't get me wrong, I was a reasonably good player but being heard by others made me edgy and uncertain. I had to spend a great deal of time learning to see the audience as my friends instead of a bunch of strangers and even more time learning to "shine" when others could hear me. But that is not actually what I want to talk about. I want to talk about the ability I developed as a result of being a shy musician; blending and matching tone. Blending into the section or ensemble is one tried and true method for shy musicians to disguise themselves. It makes it easier for players with stage-fright to keep playing when they feel that their personal sound won't be associated with them but instead will merge with the overall sound. Focusing on matching another player's timbre can create the illusion of being hidden within the overall sound. This means that I spent years unconsciously developing not only the ability to play with others but also the ability to transform my tone and blend with almost any instrument. Not that I realized this at first. In high school, when people commented on how well I matched sounds with the oboe in duets, I barely even understood what they meant. Of course I had blended with the oboe; it was how I made myself feel confident enough to keep playing even when I missed a note. It seemed so natural to me that it didn't occur to me that others weren't doing it too. By college, I began to understand that blending was a skill in its own right and well worth praising. However, I still didn't grasp the full extent of what I had been teaching myself to do with tone qualities until I took a Jazz improvisation class in Grad school. The assignment that opened my ears to my own knack came along about halfway through the class. We were required to find a good improvised solo, learn it and then play it with the recording. Most people did well with this as far as learning the solo went. But when my turn came round, the overwhelming comment I got back was "how did you make yourself SOUND like that Jazz flute player?!" A couple of students said that at first they thought I wasn't playing at all because I matched the tone so well. Thinking it through, I realized most of the other students had indeed sounded distinctly different than their chosen soloist; the notes and rhythms were fine but the tone and attitude remained their own which usually made the solo sound slightly "off" no matter how accurately they played. Unfortunately, I was still matching sounds mostly unconsciously and had trouble offering any tips on how to transform yourself from a Classical player to a Jazz player with your tone alone. After struggling for a bit I came up with the explanation of "It was easier to hear if I matched the solo that way" which wasn't the most helpful answer for those trying to figure out how to do this trick. For some time now, I've been trying to use this skill more consciously and deliberately. Instead of using it to hide within the ensemble, I try to use it to support the group. Rather than worrying that a wrong note will mark me out, I let the blending of tones smooth over the small mistakes and carry me along. Even in solos, when I am supposed to stand out, I find it helpful to remember the sound of the group and match (or contrast!) my "shining out" sound with what came before and what will be along after in a way that will help hold the whole piece together. Matching tone is mostly about two things; learning as many different ways to change your sound as possible and listening to another musician's sound with the intent of making it PART of your own. You can't be focused on stealing the spotlight for this; your attention must be on the overall result. This also isn't about finding the "best" tone quality, but about exploring the different kinds of tone. Sometimes a rough gritty tone is breathtakingly beautiful and other times the traditional crystal clear flute sound is just right. I still don't have a lot to offer to those trying to learn to do this. But perhaps with some more time spent being aware of this talent and how I use it, I will also learn how to explain and teach it. And in any case, approaching music from my strengths and focusing on what is working well adds to the joy I feel every time I hold my flute in my hands.